The First Companion Character Link Has In Any Of The Legend Of Zelda Games Is? Which Creature Uses The Poisonous Tentacles Of The Portuguese Man O' War Jellyfish As Weapons? Over the years, the hero of the Legend of Zelda franchise, Link, has had a variety of companions—including a Twili from the twilight world (Midna in The Legend of Zelda: Twilight Princess), a sailor who travels with Link in search of treasure (Linebeck in The Legend of Zelda: Phantom Hourglass), and even a renowned Minish craftsman who has been cursed into the form of a green bird-like hat (Ezlo, in The Legend of Zelda: The Minish Cap). The most notable of all Link’s companions, however, is Navi—a tiny glowing fairy. Not only was Navi Link’s very first companion, appearing in The Legend of Zelda: Ocarina of Time, but she’s also perhaps the most polarizing companion, as both a result of being first and the way in which the character was written into the game. 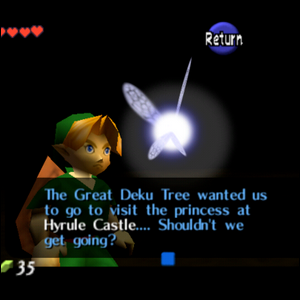 Within the context of the game, the Great Deku Tree assigns Link a fairy companion because, as a non-Kokiri living in the enchanted Kokiri Forest, he has no fairy to call his own. Not only does Navi serve as a plot device that ties into the storyline, but practically, Navi also functions as both a tutorial driver (you learn much about how to play the game by following Navi’s lead in the very beginning), a dispenser of clues (Navi gives Link tips throughout the game), and as a focusing tool (when you get ranged weapons, you then use Navi to target enemies). The inclusion of both a companion and the introduction of a more heavy handed tutorial hand-holding like methodology was a significant departure from previous games in the franchise. Earlier games like The Legend of Zelda and Zelda II: The Adventure of Link had no tutorial system to speak of, and later games like The Legend of Zelda: A Link to the Past and The Legend of Zelda: Link’s Awakening had very minor guided skill building in the beginning. Although The Legend of Zelda: Ocarina of Time is widely regarded as one of the best Zelda-franchise games, the hand-holding combined with Navi’s chattiness—mention the name “Navi” to a franchise fan and they’ll likely immediately and reflexively yell “Hey! Listen!” in imitation of the chatty fairy—led many players to dislike Link’s first companion. Image courtesy of Nintendo of America.